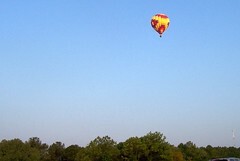 The drive to work this morning was made a little bit brighter when this hot air balloon flew above commuters on I-65. I think hot air balloons are just one of those things that make everyone happy. It was a nice start to a Monday.